What Do I Use To Sanitize My Beer? Yeast can be the home brewers best friend. It can be a really good thing because the right yeast is what turns our wort into beer! However, there’s a lot of wild yeasts and their friends bacteria and germs lurking out there that are looking to ruin our beer. That’s why sanitizing equipment is important and everyone talks about it all of the time, until they’re blue in the face. Because of the bad yeast and they’re friends, we have to sanitize everything that touches our wort/beer after the boiling process. The boiling initially kills the bad guys, but after that it’s up to us to protect our beer from outside intruders. 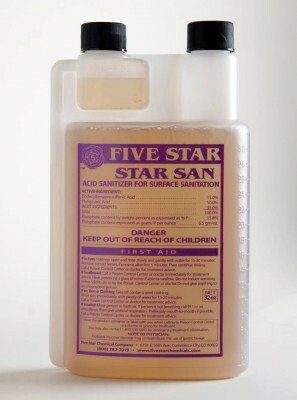 Most home brewing shops have a variety of sanitizers for sale, but the one that stands out to me is Star San from Five Star Chemicals. The others are effective, but Star San is by far the easiest that I’ve worked with. The liquid is power, one ounce of Star San will sanitize five gallons of water. It’s simple to use as just filling up a five gallon bucket with hot water and an ounce of Star Stan on brewing day and bottling day. Dip the equipment in for two minutes and it’s bad yeast and bacteria free. To make it even easier, the Star San doesn’t need to be rinsed away. It won’t hurt the beer! I tend to keep a small pot filled with hot water and Star San around while I’m working, in case I forget anything that needs to be sanitized. A spray bottle with water and Star San can be used to quickly take care of anything that needs to be sanitized. Later on when I’m going into more detail about brewing process, I’ll write more in-depth about what needs to be sanitized and how to sanitize, but for now just remember anything that comes in contact with our beer needs to be sanitized if it’s after you boiled it. What do you use to sanitize your beer equipment? Next article Best Kind Of Brew Pot For Homebrewing?